Missouri has four principal aquatic faunal regions: Ozark, Lowland, Prairie, and Big River. Each has its own characteristic assemblage of aquatic animals. To understand fish and other aquatic organisms, learn about their basic distribution patterns within the state. Missouri’s four aquatic faunal regions provide a handy way of describing where aquatic animals live within our borders. Aquatic plants and animals have distribution patterns that reflect their preferred habitats. Similar habitats are found in certain parts of Missouri. To understand fish and other aquatic organisms, learn about their distribution patterns within in the state. Just like terrestrial (land) communities, aquatic communities aren’t evenly distributed across the state. The Ozarks, in roughly the southern half of the state, are typically rugged, rocky, and forested, while the prairies in the northern and western sections are dominated by flat or rolling grasslands (and croplands), often with deep soils. In southeastern Missouri, the flat Bootheel lowlands were historically dominated by swamps. So it shouldn’t be surprising that with the rocks, soils, terrain, vegetation, and water-flow patterns varying in each region, our creeks, rivers, ponds, lakes, reservoirs, and wetlands should also vary by region. Missouri biologists specializing in aquatic animals (aquatic fauna) often use the following four regions to describe where fish, crayfish, and other aquatic animals live. Many Ozark streams are fed by the cool, clear water of springs. In Missouri, the Ozark highlands occur mostly south of the Missouri River. To the east, they end where the Bootheel lowlands begin, and to the west, they gradually turn into the Prairie Faunal Region, along a line drawn roughly from Morgan through Jasper counties. Geologically, the Ozarks are an elevated plain of ancient bedrock, through which streams have carved deep channels, creating a complex system of rugged hills, rock outcrops and bluffs, and thin, stony soils. Much of the land is forested, and the primary agricultural use is pasture. The limestone and dolomite karst geology in the Ozarks is famous for its caves and springs, and these influence the character of Ozark streams. Ozark streams typically occupy narrow, steep-sided valleys and often are a series of short pools connected by well-defined riffles. Chert gravel is often at the bottom of the stream bed. 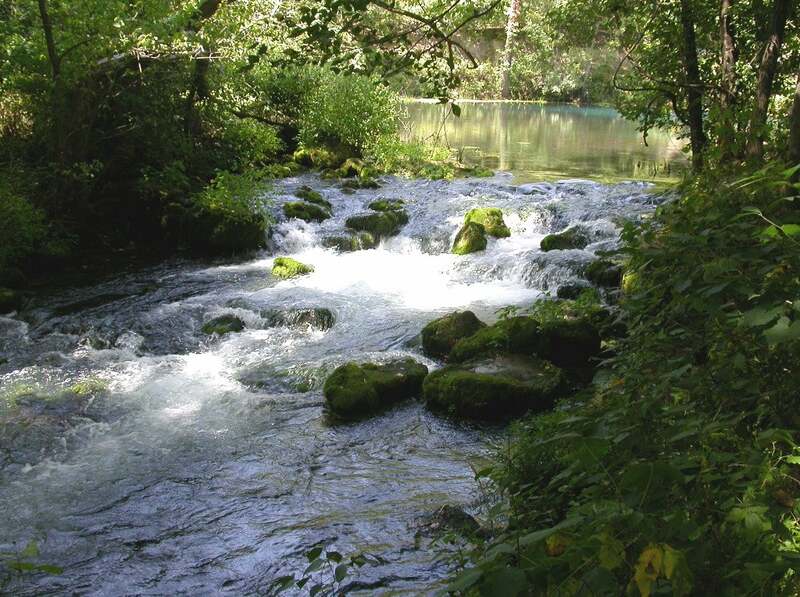 Ozark streams are typically clear and relatively cool, often because they are fed by springs. The aquatic animals that live in these clear, cool, high-gradient, fast-flowing, chert-bottomed streams are particularly diverse, because the many separate stream systems are generally isolated from each other. Thus a crayfish species that lives in one stream may not occur in a separate stream only a few miles away — as the crow flies — because they cannot travel overland to reach that different stream system. In addition to its famous streams and springs, the Ozark Aquatic Faunal Region also contains some large reservoirs created when certain rivers were dammed. The Lake of the Ozarks and Table Rock Lake are examples. These large lakes have their own habitat conditions quite different from Ozark streams, and their dams prevent aquatic animals from moving past them, particularly upstream. Otter Slough CA, in Stoddard County, preserves some of Missouri's last remaining native Bootheel swamps. Missouri’s Lowland Aquatic Faunal Region is mostly in the seven counties in or near the Bootheel. There’s an abrupt change of elevation — anywhere from 50 to 250 feet — as you travel south or east from the Ozark Plateau into that section. Much of the lowlands are not much higher than the Mississippi River itself, being less than 300 feet above sea level. Historically, this area was nearly always flooded by Mississippi River backwaters and covered with swamps wooded with bald cypress trees, but starting in about 1900, people cleared the forests and constructed channels and ditches to drain the wetlands. Not much is left of the Bootheel’s presettlement landscape. Vast, sunny fields of cotton and other row crops now dominate the Bootheel. What remains of the plants and animals that are native to that area are confined to drainage ditches of various sizes, plus Mingo Swamp, Otter Slough, and other publicly owned nature preserves. Many of these plants and animals are found only in the Bootheel and nowhere else in the state. Punkin Center Access, north of Chillicothe, is a public access point to the Thompson River. This aquatic faunal region includes most of the state north of the Missouri River, plus a wedge-shaped area south of the Missouri along the Kansas state line. This region is mostly flat or rolling plains. The area north of the Missouri River was flattened by glaciers long ago; the prairies south of the river were not glaciated. Shales and thin sandstones are the principal bedrocks, but these can be covered by as much as 150 feet by loess soils (loess is a coarse-grained material blown by winds during glacier times and which collected, like dunes, in certain areas). Missouri’s prairie regions, today, are dominated by cropland, but before settlers arrived and broke the sod with their plows, these lands were covered by treeless tallgrass prairie, with woods in the more hilly areas. Those native grasslands and forests are nearly all gone. The Prairie Faunal Region is drained by a number of rivers. These typically occupy broad, flat valleys that slope gradually into the surrounding uplands. Originally, most of these streams meandered in S-shaped courses and often formed oxbow lakes and sloughs as they shifted their beds. Most of these streams, however, have been channelized and are now straight with a nearly uniform depth. The stream bottoms in the Prairie Region are typically silt, sand, or gravel, and the water is generally turbid (not clear, due to clay and soil particles suspended in the water). Stream flow and other water conditions can vary over the course of a year, so the animals that live in these streams must be able to tolerate fluctuations of current, depth, dissolved oxygen levels, temperatures, and so on. Hartsburg Access, in Boone County, offers a public access point to the Missouri River. Our two biggest rivers, the Missouri and Mississippi, are so different from our other aquatic habitats that they constitute their own faunal region. The water conditions of these rivers are less influenced by local conditions than by the rainfall and runoff from all the land they drain — indeed, much of the United States. Since they have been channelized, their flow is swift and constant, and public engineers continually monitor and dredge the channel, to keep it deep enough for barge traffic. Although dams upstream have reduced turbidity, it’s still appropriate to call the Missouri “the big muddy.” The channel bottom of these rivers is covered by shifting sand, gravel, and silt. Animals living in the Missouri and Mississippi must withstand the strong current and turbidity. Channels and levees have eliminated much of the wetland habitat that used to occur along the river bottoms, but after catastrophic floods in recent decades, people have been more receptive to the idea of establishing wetland buffer zones to absorb floodwaters. This web page borrows heavily from William L. Pflieger, Aquatic Community Classification System for Missouri, a 69-page book plus a supplement, published in 1989 by the Missouri Department of Conservation, Jefferson City. Two other books by Pflieger, also published by MDC, will be of special interest as well: The Fishes of Missouri, 1997 edition, a 372-page complete reference to our state’s fish fauna, and The Crayfishes of Missouri, published in 1996, the definitive reference to the state’s crayfishes. Dr. Pflieger deserves deep gratitude from all Missourians for contributing such useful and comprehensive intellectual resources for understanding our state’s natural history.